One of the distinctive features of Byzantine worship is that all services are chanted or sung without instrumental accompaniment. Yet the instructions in the liturgical books often mention that bells are to be rung before, during, and after the divine services. These instructions are quite detailed both as to the exact times and the manner of ringing. Bohdan Turetsky, who wrote many of the icons on the church’s iconostasis, has designed a charming bell tower in accordance with the traditional wooden architecture of Ukraine. The tower has a 16 foot square base and is approximately 33 feet in height. Like the church, it was built with heavy timbers and sheathed in cedar siding. It will serve as an aural and visible beacon calling us to worship and glorify God, who has blessed us with an abundance of good gifts." 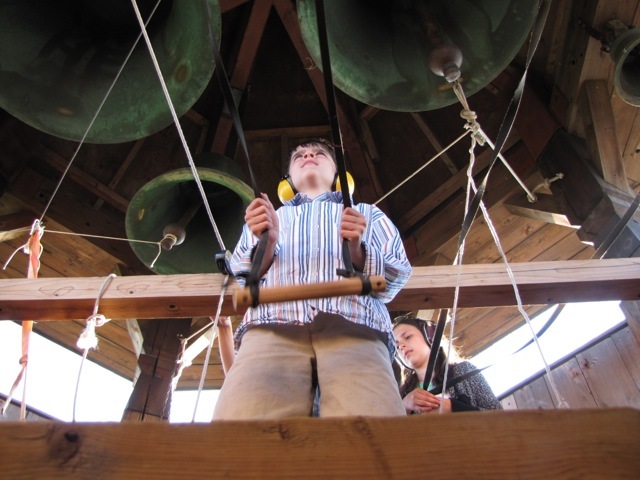 One hears bells often rung, but to experience them as an integral part of the Byzantine Liturgies or to have them suddenly reach deep into the soul and exalt the Spirit, is a phenomenon almost incredible were it not actually easy to experience. The effect is quite ineffable. As one author put it: "On great feasts they remind us of heavenly blessedness; on Saints' days, they tell us of the unending rest of the holy dwellers in heaven; during Passion Week they remind us of our reconciliation with God through Christ the Saviour; "and during Bright Week they announce the victory of life over death and the eternal unending joy of the life to come in the Kingdom of Christ. Blahovest - literally meaning "Good News." This is the measured striking of one bell for the beginning of a service. Zvon - literally meaning "Peal." This is the ringing of all bells. Dvuzvon – literally meaning "Double Peal." This is the ringing of all bells then an interval of silence, followed by a second ringing of all bells. Simply put, this is the ringing of all bells twice. Trezvon - literally meaning "Treble Peal." This is the ringing of all bells three times. Perezvon - "Chain-peal." This is the striking of each bell several times beginning with the largest bell and proceeding to the smallest bell. This chain is repeated as long as necessary. This is used before any Blessing of Water. Perebor - "Chain-toll." The slow striking of each bell once beginning from the largest bell and proceeding to the smallest bell. After the chain, all bells are rung together. This is repeated several times. This is also called burial or funeral ringing.